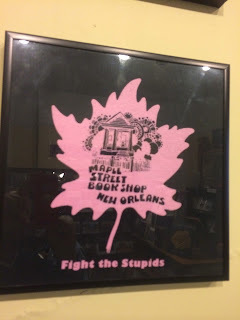 Readers, this blog entry is not about a bookstore I've never visited. Consider this entry more of an update about a hometown store that has undergone a change in ownership. This bookstore has been around for about 4 years, first as Newbo Books, then Next Page Bookstore, and now Next Page Books (Bart C., the new owner, tells me that the slight name change is just because its easier to answer the phone, "Next Page Books," instead of, "Next Page Bookstore). So yes, Bart C. is the new, proud owner of this indie and is going on his 3rd month of ownership. 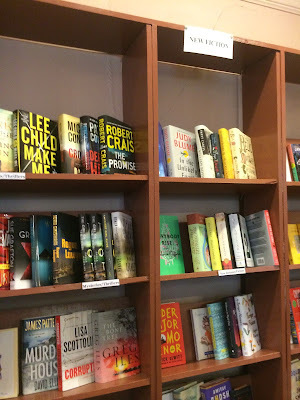 January and February can be tough times for midwest bookstores but this store has held its own and with the coming of spring right around the corner is optimistic for an uptick in business. 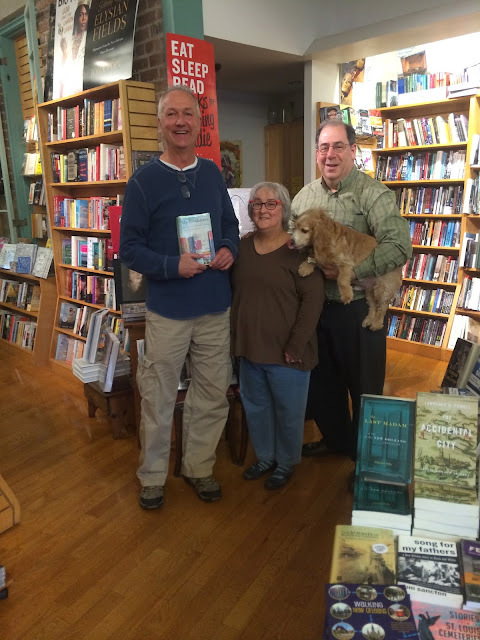 As the independent bookstore movement continues to show growth, that feeling is shared by Bart here at Next Page Books. The store is still in its great location, the historic CSPS Building in the Newbo District. This business benefits greatly by being surrounded by many other independent businesses. In fact, survival would be difficult without their presence. It continues to offer a solid inventory of books in a small one-level setting. What this store lacks in space it makes up for in charm to the nth degree! And as Bart told me, some customers prefer visiting this smaller size compared to a large chain store. The sidelines have been expanded just a bit and are also helping to improve the business. I think Bart is doing a great job of increasing the store's visibility in order to attract more customers. Community outreach in the neighborhood, advertising in the local flyer, increased social media presence, and a great partnership with the next door coffee house, Brewhemia, are all helping improve the brand. The store continues to schedule author events and has space flexibility for these within the CSPS Building. In short, he's doing all the things that all successful indie owners are doing. Thanks to this great location, the store attracts lots of out-of-towners who visit the Newbo District, especially on weekends. 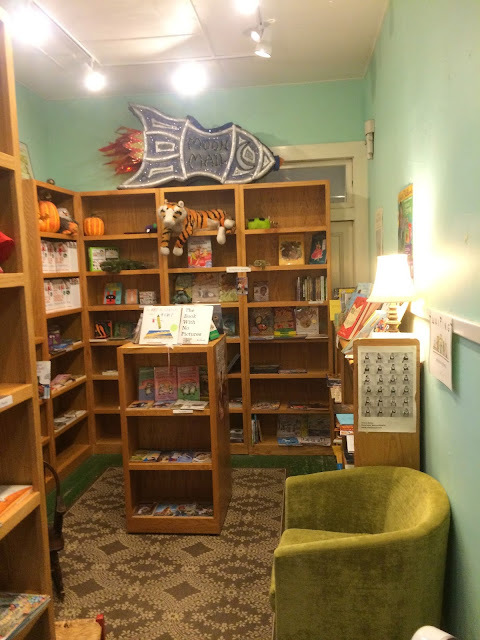 There are also many professionals in their 20s and 30s who move in to the area and are aware of the importance of local independent bookstores and are finding their way here. I know all of the staff here including Amy, Jody, and Julie, as well as Bart. Whoever you meet when you visit, you'll enjoy a 5-star bookstore experience. So Eastern Iowa, what are you waiting for? If you've never been here you're 4 years late to the party. For shame! Excuse my French, but get your a##es in gear and support your local independent business. This bookstore and the district where it is located are gems. Grab a friend and check it out. Go to an indie and buy a book. Bonsoir. JUST FINISHED: Room, Emma Donoghue. Woman and her 5 year-old son are imprisoned in a one-room enclosure, held by the man who sexually abused the woman. Escape is impossible. Or is it? Creepy subject, fantastic book. Highly recommended. CURRENTLY READING: Cold Comfort Farm, Stella Gibbons. Looking through the store from the front entrance. That's Bart on the right. Check out the ceiling. I love those old ceilings in historical buildings. Looking to the left from the front. Start browsing your fiction here. They also carry boxed sets of greeting cards and journals. A nice display near the entrance of recent releases. Great places to sit and try out a book. A timely display for Black History month. Another nice view looking along the shelves toward the back of the store. Take a crack at progressive Scrabble. With Bart on the left. Thanks for a great visit. This entry is a courtesy to all the long-suffering, winter-enduring friends who are forced to tolerate snow, ice, and wind chills wherever you live. Yes, this blog is about independent bookstores in the United States, however, this entry is about a bookstore in Mexico and could easily morph into a travel blog entry. I try to plan my bookstore visits strategically; in the winter go south and west, in the summer east and north. So this visit I take to the extreme and go to Mexico. 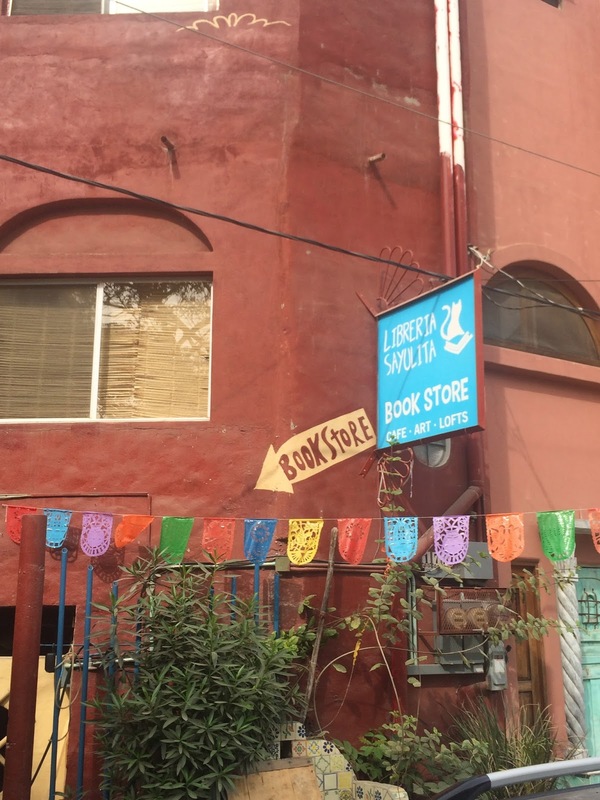 Beautiful weather in a wonderful Mexican town on the coast and an independent bookstore with terrific people. The best of EVERYTHING! 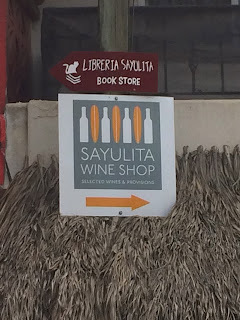 Libreria Sayulita (The Bookstore Of Sayulita) is located in a small Mexican coastal town on the Pacific side. There is a lot to see and do in this perfectly delightful town, including visiting an independent bookstore. 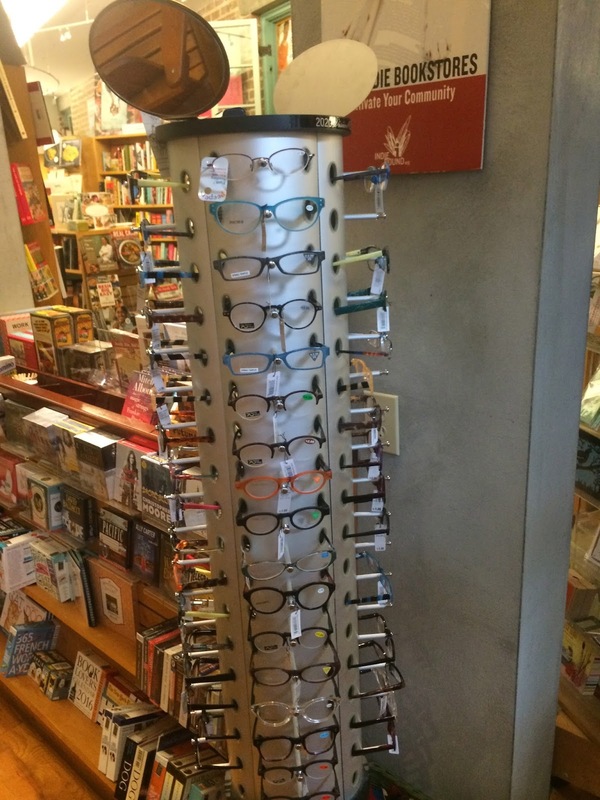 This store shares many characteristics with the bookstores in the US. 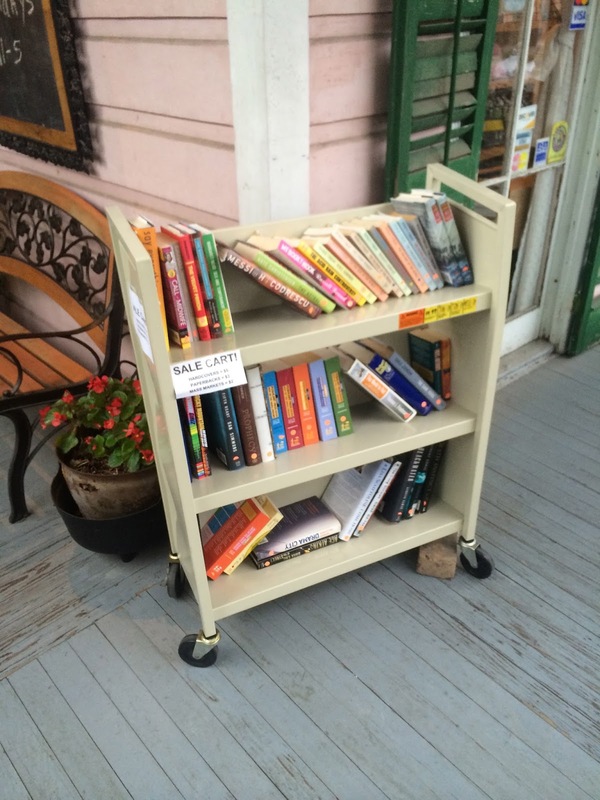 This is a one-level, multi-room store offering mostly used books. They have a small cafe right at the front of the store, featuring Julia's coffee (highly recommended!). It's organic and Julia brings it in from only 90 minutes away. Local and independent, all the way! You can also hook up to wi-fi here, making this bookstore a perfect stop. 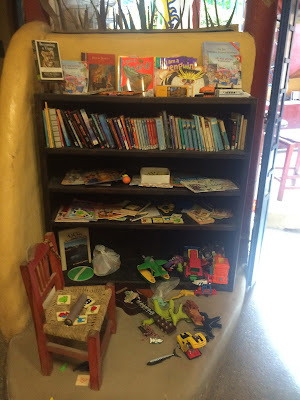 You won't find sidelines here but you will find some good local art work, including some paintings by Ed R., co-owner of Libreria Sayulita along with his wife, Nancy R.
There's no way Ed and Nancy could make it just on this bookstore. As Nancy says, the bookstore is their "beans and salsa" money. Their primary revenue source are their loft apartment rentals located above the bookstore. There are a variety of options for getting here including a taxi or a bus, available from Puerta Vallarata, Bucerias, or any of the coastal resorts. The bus will be the cheapest and I would discourage driving a car here. Leave the driving to somebody else. Once you're in Sayulita, you can walk around town or rent a golf cart to drive. But as with so many of my visits, the people I met were just the best. Nancy R. and Maria, one of the employees, could not have been nicer. Nancy and Ed are here from November - May and then return to Edmonton, Alberta. 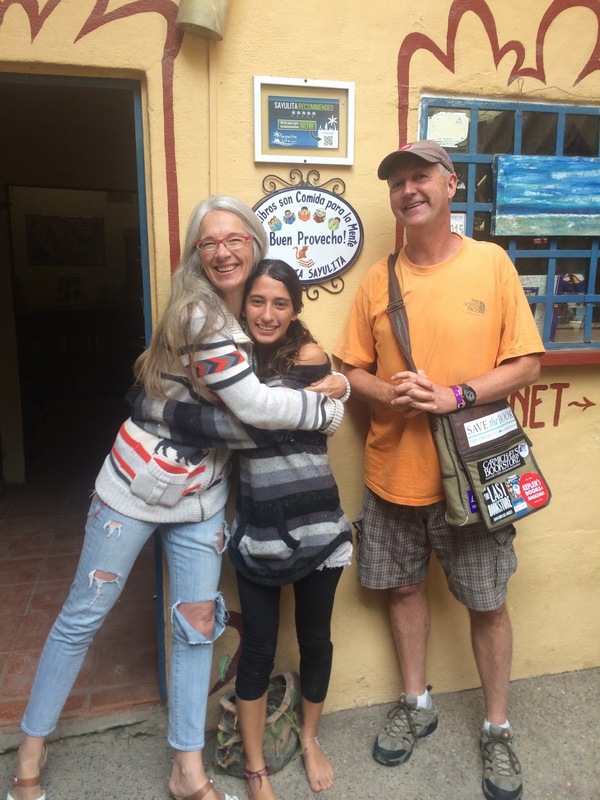 But thanks to Maria, they can keep the store open year round since she stays in Sayulita. The store has been going for about 8 years now and its supported by a variety of customers including locals, tourists, ex-pats, surfers, and others. But you don't have to just read in Sayulita. The beach is only two blocks away so grab your book, your surf board, and have at it. Reserve a rental above the bookstore and I don't know how it could be any better. If I disappear during the winter months, someone check here. You might bump into me. Plan a vacation to this nice town and enjoy some time at the independent bookstore you'll find there. Ir a un indie y comprar un libro. Buena tarde. JUST FINISHED: My Grandmother Asked Me To Tell You She's Sorry, Fredrik Backman. By the same author who wrote, A Man Called Ove. If you liked Ove, I think you'll like this. I like the characters in this book, especially Granny and her granddaughter Elsa. They have a special relationship and march to their own drummer. Both are rather feisty. If you read Ove, he and granny would make a good match. CURRENTLY READING: Room, Emma Donoghue. Translation: Books are food for the mind. Bon Appetit! A portion of the cafe located right outside to the right of the entrance. View stepping into the bookstore. Some of you may recognize the Indie Bob Spot graphic artist, copy editor, and travel administrator in the foreground right, Cheryl M.
If it's a rainy day in Sayulita, this is where you'll find the kids. Another room within the store. The store sells mostly books in English, but you can find books in Spanish as well. You can stay in one of these loft apartments located above the bookstore. Some of the magazines available. A great place to spend some time in a bookstore. Hang out with some friends and start a book club. Much of the art on the walls is by Ed, one of the co-owners. The only way the coffee would be any fresher here is if they grew it right in the store! You can't go wrong if you see this sign, a win-win! With Nancy on the left and Maria in the center. Thanks for a great visit. Readers, you've all heard of individuals who have had near death experiences. People who have gone to the edge of the other side and then returned to the living. That's what happened here to Maple Street Books in October of 2015. Maple Street was on life support and they decided to give it last rites and pull the plug. But a funny thing happened. It had a near death experience and returned to life. The resuscitation happened thanks to a community that refused to let their independent bookstore go. When the closure was announced in October of 2015 the store received a surge of business. It was so good that the owner, Gladin S., announced that the store would remain open into 2016. So now the next challenge begins and that's where all of you come in. The store was opened in 1964 and has been under varied ownership since then. It's always been located on Maple St. in a mostly residential area surrounded by a few other small businesses. It's in a very old house with multiple rooms and bare wood floors, giving it a good, rustic bookstore feel. 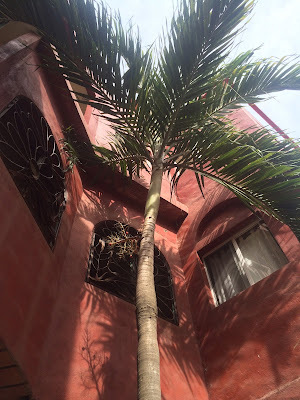 The location allows it to have a great local customer base and it also enjoys good customer traffic from the university communities and some tourists. The store offers both new and used books, shelved together throughout the store. 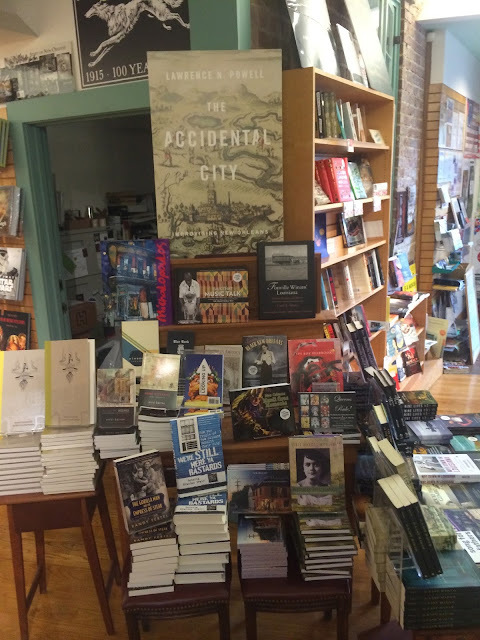 Their strongest offerings are books of local interest, including Louisiana. The children's department is excellent thanks to Cindy D., who has been involved with the store for many years. They also offer a weekly story time, a great thing for this neighborhood since there are many families with young children. There are only a few sidelines here but that is something Gladin is hoping to expand in the year ahead. The store is very active with author events and has some good flexibility for hosting in the store or off-site. But the real story here is Gladin and his willingness to keep the store open and work at reducing its debt. They're living month to month at this time, but he's hopeful of continuing to make improvements and show growth. I had a great time talking to both Cindy and him. They told me so much about the store I can't possibly recount it all here. Now here's your call to arms. Help rescue a store, our culture, and our heritage. On your next vacation to New Orleans, put this on your list. If you're in New Orleans and know about this place, visit it and take a friend. 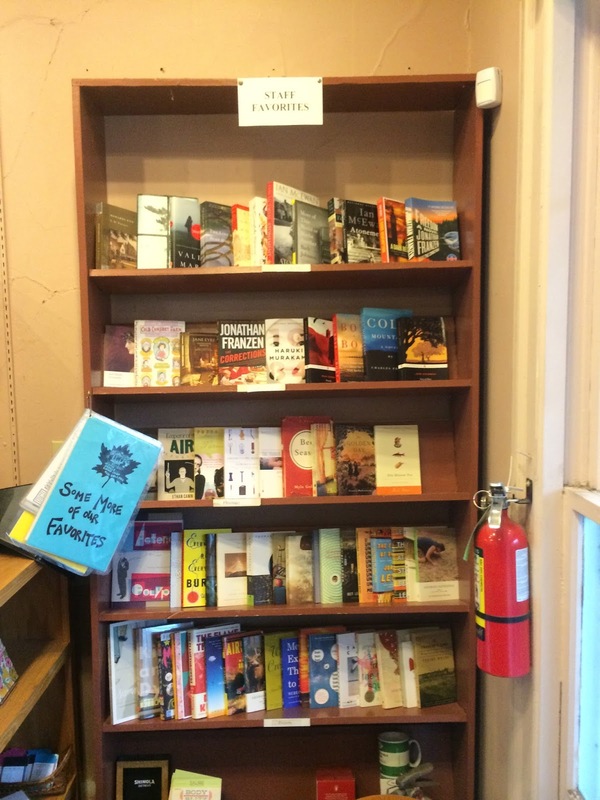 Do something to spread the word about a worthy independent bookstore that is now enjoying a rebirth and deserves to build on its storied and well acclaimed past. Go to an indie and buy a book. Bonsoir. JUST FINISHED: Medical Medium, Anthony William. If you're interested in alternative solutions of medical issues that the doctors can't diagnose accurately, this is a MUST read. Absolutely fascinating. CURRENTLY READING: My Grandmother Asked Me To Tell You She's Sorry, Fredrik Backman. RECENTLY PURCHASED: Not purchased but gifted. The Keepers Of The House, Shirley Ann Grau. Thanks Gladin. A great view from the street. 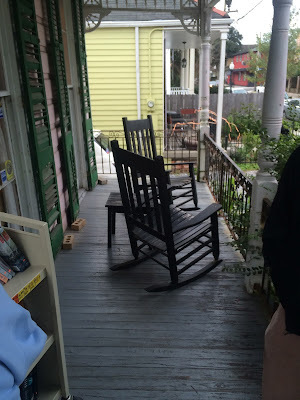 This front porch looks like a great place to try out a book and enjoy the neighborhood. You can look for a bargain on this cart before you even enter the store. View looking into the store from the front entrance. Astute readers may recognize the reclusive celebrity on the left. Yes, that's my mom. I love this slogan and you can get it on a t-shirt here. If you don't want to sit on the front porch look for these seats in the store. Display of some of the local interests and authors. 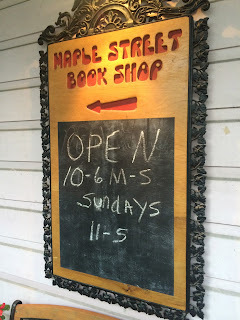 A genre unique to Maple St. Books! A view looking toward the front of the store. With owner Gladin S. on the left. Thanks for a great visit. 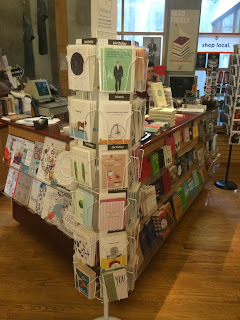 This indie was an exciting visit for me because one of my favorite book characters came alive in this store. When you read, My Bookstore, by Ron Rice, make sure you read the chapter about Octavia Books. One of my favorite characters, Pippin, appears on those pages and on this visit I met the real-life Pippin. Pippin is on staff at Octavia Books and meeting him exceeded my expectations. And visiting Octavia Books and seeing this award-winning indie equally surpassed my expectations. I knew this place would be good though. After all, it's featured in, My Bookstore, the inspiration for my journey. 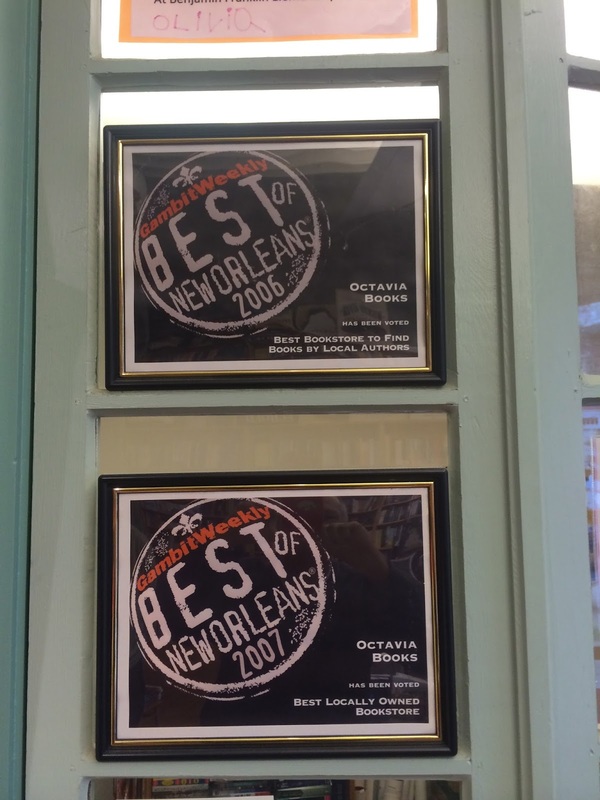 Octavia has received numerous awards for excellence in the New Orleans area. Not only is this place good, but it's tough. It survived Hurricane Katrina with barely a scratch and was able to continue moving forward. Heck, they even had an author event the night before. Then, Tom L. and Judith L., the owners, packed up and left town the next morning at 4AM. Tough, resilient, and now going strong for over 15 years. Octavia Books is located in a residential area with very few businesses positioned nearby. Narrow streets, with cars parked on both sides make driving here a challenge. But you'll love the journey and enjoy seeing many large, grand old houses along the way. The location reminds me of a place the 10-year old version of myself would ride a bike to. The interior is a medium-sized "L" shape featuring all new books and a few of the usual sidelines. 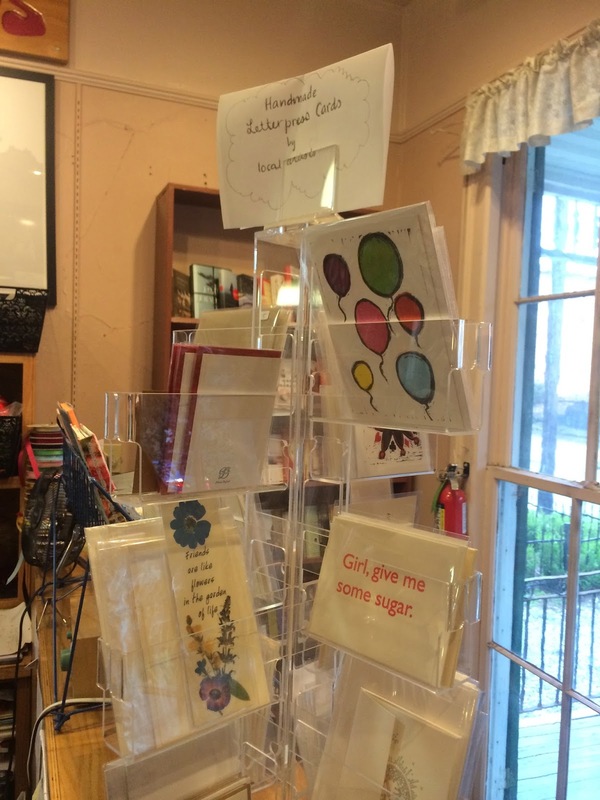 The greeting cards are especially popular. I think they have a strong collection of books of local interest. Think jazz, French Quarter, Mardi Gras, history, and cooking. The store has a very active events schedule and is able to host them right on-site. I was so lucky to meet Tom and Judith, who came into the store just to talk to me. They were fantastic to spend so much time talking to me and telling me about the store. Their secret to success is similar to what I hear at other successful bookstores. They have good people on their staff and have a strong core of local and regular customers. And now that many of you are hearing about how great this place is, I'll expect them to see a spike in tourists! The challenge here though is different from all the other indies. None of the others have to deal with Mardi Gras like Octavia does. What does that mean? Tom told me it means 2-weeks of people's minds not on buying books. Maybe I can change some minds? No matter the season, ANY time of year is a great time to visit this renowned bookstore. Go to an indie and buy a book. Bonsoir. JUST FINISHED: Boundary Waters, William Kent Krueger. If you haven't checked out this author yet, I encourage you to do so. This is the second one of his books I've read (Ordinary Grace is the other) and I've liked them both. This one involves a search and rescue in the boundary waters on the the US/Canadian border, lots of unsavory characters, and one righteous former sheriff who tries to make things right. Lots of Indian folklore as well. I loved this book. CURRENTLY READING: Medical Medium, Anthony William. RECENTLY PURCHASED: Nine Lives, Dan Baum. Song For My Fathers, Tom Sancton. View looking into the store from the front entrance. When you get to the back, the "L" shape of the store will continue to the right. Devoted readers will notice the celebrity in the foreground. Yes, that's my mom. A very active events schedule. Looking toward the left from the front entrance. 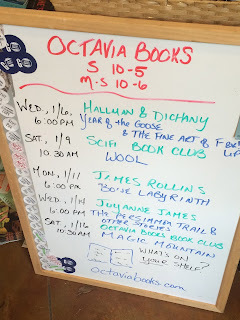 Local interests and local authors is one of the strengths at Octavia. Here's a display of those offerings. Most events are held right in the store. You can find these greeting cards at the check-out counter. 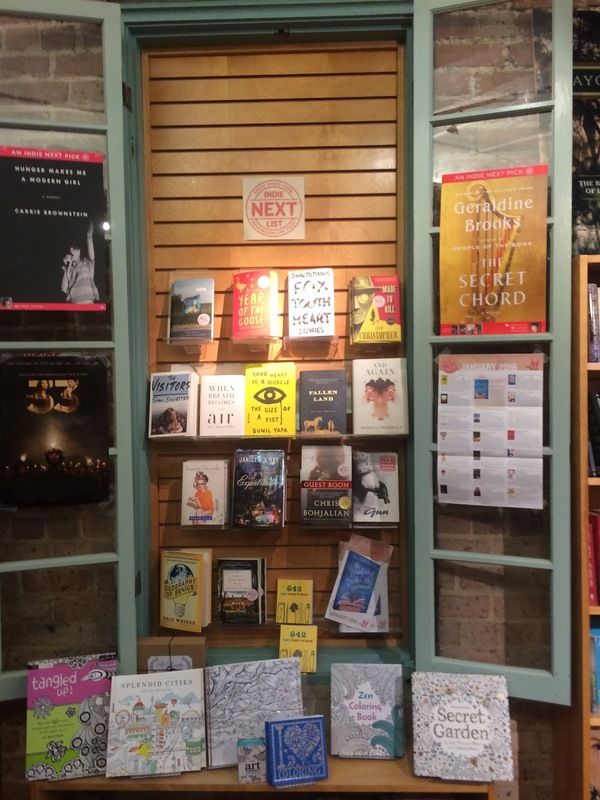 A display of some of the indie picks and also some adult coloring books in the foreground. 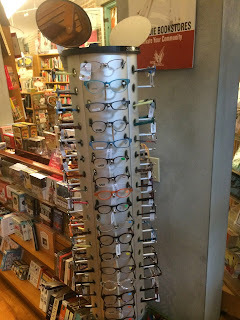 If you need readers, find this display. A nice place to sit and take a book for a spin. Notice that book front and center? That's why you're reading this article. 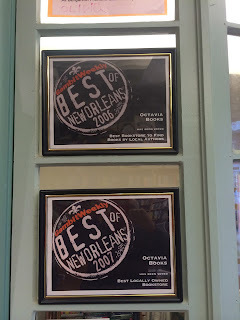 Octavia has been recognized MANY more times as the Best of New Orleans. I didn't need to see these for confirmation of that! With Judith in the center and Tom on the right holding Pippin. Thanks for a great visit.